If someone had handed me this book and said, "Read this - it's a moving story told in graphic-novel format about a young woman coming to terms with her father's death," I'd have said, "Nuh-uh. No way. Too depressing." Luckily for me, then, that I read Nymeth's review, which did not paint the book in a depressing light. I've come to trust her over the past few years, and I take risks on books I might not normally read when she recommends them, because she hasn't steered me wrong yet. (Thanks, Nymeth!) I had not realized till I started reading, however, that a book about such a dark topic could be heart-wrenching and laugh-out-loud funny at the same time. Alison's story is told retrospectively, from the point of view of her older self looking back at her life, depicting scenes from her childhood interspersed with scenes from her life as a young adult. The story centers around her relationship with her father, who is a fascinating character (if not the sort of person one would consider to be the ideal dad). He is an English teacher, manic-depressive, addicted to the restoration of their Victorian home, a man who would have made completely different choices had he been born in a different place and time. He is a complex, troubled man for various reasons that I will not go into here, because I don't want to give too much away. The graphic novel is the ideal format for this story. 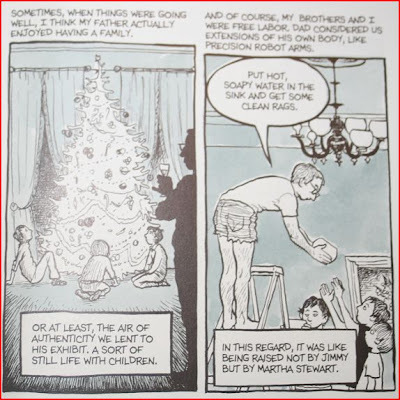 The panels depict Alison's childhood with the simplicity and immediacy she experienced at that time. 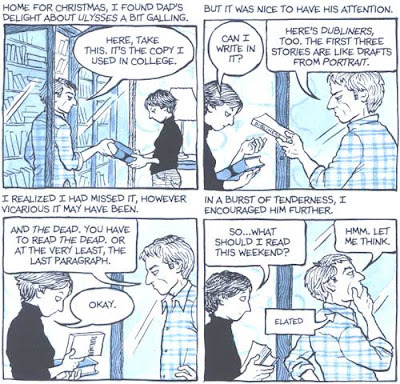 The narration describing panels is the older Alison's point of view, her interpretation of the scenes and situations presented in the illustrations. The contrast between the older narrator and the young protagonist lends the tale the humor - and pathos - as the author looks back and reinterprets her childhood in light of what she now knows to be true about her parents and their lives. I loved the way Alison lives and breathes literature - and how she uses literature to analyze her current life, her childhood, her sexuality, and the relationships she has with others. She discovers herself - who she is, who she wants to be - through books, an attribute I identify with wholeheartedly. It is literature that enables her to connect with her father, and while that connection isn't an entirely comfortable one, it is a meeting point for them, and it enables her to understand her father in a completely new way. The artwork is black and white with shading that, in my copy of the book, is grey-toned rather than the bright blue of these images, and it is expressive and detailed, giving as much characterization and depth to the characters as the words themselves. This is a bittersweet, funny, compelling memoir, and I highly recommend it. Here is a fascinating article that appeared in Slate by Bechdel called "What the Old Ladies Feel: How I Told My Mother About My Memoir." She writes: "Now I know that no matter how responsible you try to be in writing about another person, there's something inherently hostile in the act. You're violating their subjectivity. I thought I could write about my family without hurting anyone, but I was wrong. I probably will do it again. And that's just an uncomfortable fact about myself that I have to live with." And here is a link to Bechdel's website, which links to her blog and her syndicated comic strip about gay and lesbian life called "Dykes to Watch Out For." 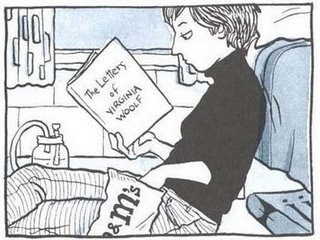 Jenny's Books: "Bechdel makes use of myths and literature throughout the book – she talks about a book she read at a certain time in her life, then carries on talking about its relevance to her life, her sexuality, her relationship with her father, whatever – while the characters in the panel carry on discussing the book. I am so impressed by this." Largehearted Boy: "Bechdel is as talented an artist as she is a storyteller, and this book is the proof. 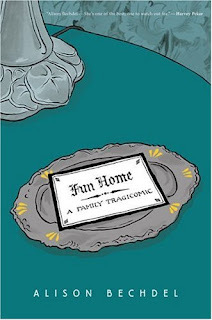 Fun Home is my favorite book of the year, and is strongly recommended." Things Mean a Lot: "The artwork in Fun Home is both simple and extremely expressive, and it couldn’t suit the story more perfectly. This is an honest, intelligent and sophisticated book. And a very good read." I love that you pointed out Nymeth's review because that cover obviously doesn't do the book justice. This sounds like something special and intimate. I don't normally read graphic novels myself, but I like the 'excerpts' you put out there. Jenny - You're absolutely right! What would we do without her? Serena - Yes, there is a lot more to this one than the cover would indicate. Sharry - I think 'special' and 'intimate' are great words for describing this book! Nymeth - Of course I did. :-) Thanks again for the recommendation. Kailana - Which ones have you enjoyed the most? Sorry to hear this one didn't work for you. I really like how in your review you point out how the graphic novel format can work so well in telling a memoir. For me the book was a toss-up - I enjoyed the art and design but couldn't empathize at all which kinda ruined it for me. Joanne - I think it resonated with me because it reminded me in some ways of my own childhood, and how it helps to really have a good sense of humor when you look back on how things were. So maybe it's not such a bad thing that it was a toss-up for you!